Marygrace Sexton beat the odds and proved the naysayers wrong. Adding value to commodities intrigues many farmers. Few act on that entrepreneurial dream and fewer still succeed with it. Marygrace and Bobby Sexton thought their Florida oranges and grapefruit could command a better market. With the industry dominated by large corporations, doing something different could be a tough move, though. They knew they couldn’t be just another me-too juice. Bobby wanted to see if there might be a niche in the market for a premium fresh-squeezed product. A fifth generation citrus grower, he came from a family of innovators long involved with the industry. Growing fruit and running the packinghouse took all his time, however, so Marygrace stepped up. In 1989, they started small, with Marygrace juicing oranges on an old extractor at an out-of-business roadside fruit stand. 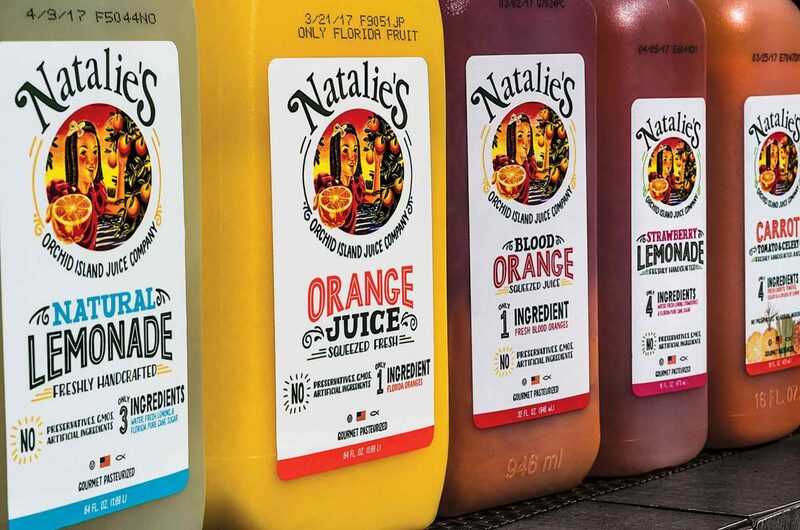 She named the business Natalie’s Orchid Island Juice, after the Sextons’ young daughter, and took juice to a Miami farmers market, arriving in the early morning hours wearing a dress and heels. To Floridians, this juice tasted like the real deal, like juice from fruit just plucked from a backyard tree. In short order, Marygrace had buyers lined up She borrowed a refrigerator truck and started personally making deliveries. Marygrace Sexton’s one-woman effort to sell high quality citrus juice turned into a business with 130 employees and sales across the nation and world. 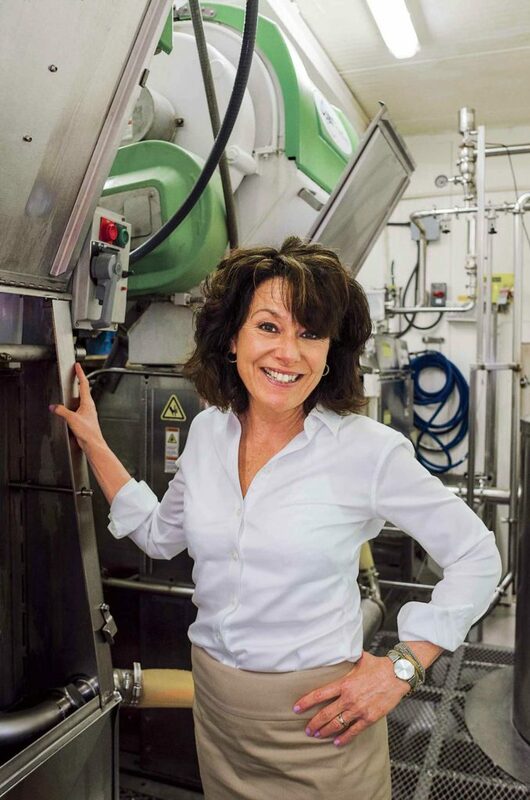 Within a month, her brother, John Martinelli became the company’s first full-time employee. He’s still there as executive vice president. Once an All American center on the football team at Georgetown College, he towers over his sister, lending advice and help. But never doubt who’s in charge. The focus remains Florida-grown high-quality minimally processed fresh-squeezed juice, sold for a premium price. The juice is ‘gourmet’ pasteurized for as little as six seconds at the lowest temperature allowed by the FDA. Rather than using preservatives, the juice is shipped frozen. Bobby’s hunch proved correct. Their juice is now sold in 35 states and 32 countries. Based at a facility in downtown Fort Pierce, Florida, the company employs 130 people. “We started with two people, John and myself. It’s successful because we sell the highest quality products, and it’s successful because we employ great people,” Marygrace says. The company buys from other Floridians producing quality fruit, and only sells grown-in-Florida products. “We stress our Florida connection. It’s important. We have a long history in Florida and we want to do our best for Florida agriculture,” she says. Starting with orange and grapefruit juice, they’ve expanded to blood orange juice, honey tangerine juice, tomato juice, and a number of blended juices ranging from orange/beet to orange/mango to carrot/tomato/celery, lemon, lime, lemonade, and others. “We guarantee our juices have no preservatives, no concentrates, no flavor packs, no GMOs and no artificial ingredients. In today’s marketplace, that’s what a lot of consumers are looking for. Our packaging is 100% recyclable. Our raw fruit peels go to feed local cattle,” Marygrace says. Their business with blends enables them to tap into the expanding fruit drink business. Seeing how it builds can be a bit surprising at times. “The beet/orange juice blend grew faster than any blend we’ve had. The tomato juice blend also grew fast. They’re both aimed at athletes. Beet juice puts oxygen into the blood. Tomato juice helps muscles. 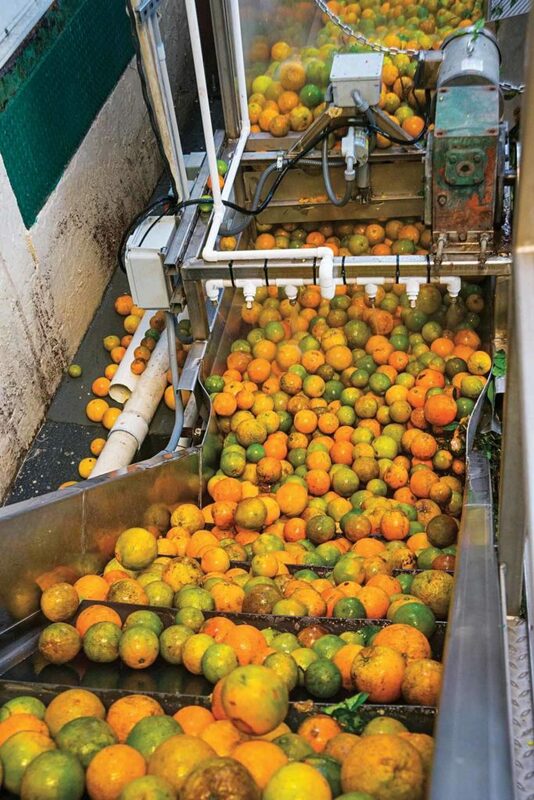 Oranges move along the line toward the extractor at Natalie’s Orchid Island Juice headquarters in Fort Pierce, Florida. “Our customers get ideas and say, ‘Can you do this or that? Could you try this?’ We’re small enough that we can try things and service the market. We don’t spend anything for a new product to take off,” Marygrace says. “We’re small enough that we have very nimble production capabilities. We can move pretty quickly. As we see the marketplace moving to something like prepared dinner recipes, we’ll be able to add our product lines to that,” John Martinelli says. The business, following Marygrace’s direction, is about living a healthy lifestyle. Marygrace is an avid cyclist, and the company’s view reflects her attitude. She had a workout facility built at company headquarters. Employees can exercise free and have access to personal trainers on company time. The company also sponsors bicycle races and other athletic events around the nation. “We’re a local company and we’re involved with the people here. A juice drink company should promote health. Marygrace’s vision is not only for the development of this company but also for each person. She put together a company library of self-improvement books to help develop the inner person. We know we can’t be Natalie’s without the people who work here,” Bil Martinelli says. Marygrace, the company founder and CEO, has no plans to retire, but she does have a succession plan. “Businesses started by entrepreneurs tend to fail with the second generation taking over. We don’t want that to happen, so we have plans for exactly what could happen,” she says. Initiative. For now, they’ll keep building the business. Bobby grows the citrus and keeps his mind busy with new ideas. Marygrace leads the troops. “My brother-in-law has an entrepreneurial mind. My sister has the entrepreneurial initiative. She can’t find decent juice to serve the children, so she makes it and takes it to the world,” John Martinelli says. What can a farmer make with corn, barley, and rye? Making the move to organic production.